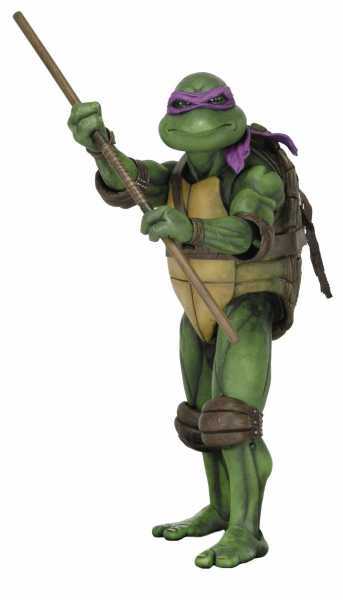 Produktinformationen "TEENAGE MUTANT NINJA TURTLES DONATELLO 1/4 SCALE ACTIONFIGUR"
Cowabunga, dude! NECA is proud to announce its first ever 1/4-scale action figures based on the classic Teenage Mutant Ninja Turtles movie. Donatello is the Turtles' resident techno-genius, but make no mistake - he's world-class with the bo staff. This highly detailed action figure stands 16-1/2" tall and features 30 points of articulation, including double knee joints, to fully showcase Donatello's mastery of the martial arts. It's entirely accurate to the movie, and comes with bo staff accessory and interchangeable hands. Weiterführende Links zu "TEENAGE MUTANT NINJA TURTLES DONATELLO 1/4 SCALE ACTIONFIGUR"
Kundenbewertungen für "TEENAGE MUTANT NINJA TURTLES DONATELLO 1/4 SCALE ACTIONFIGUR"